actor Charles Farrell was born at Cape Cod Mass. 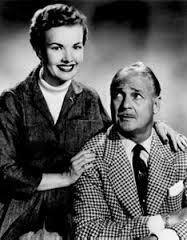 Although his acting career began as a romantic lead in the era of the silent movies, he is best remembered today as Vern Allbright, Gail Storm‘s father in the early TV sitcom My Little Margie (below). He died May 6th 1990 at age 88. In 1911, radio/TV newscaster Robert McCormick, for more than 30 years a feature member of the NBC news corps, was born in Danville Kentucky. He broadcast some of the first televised news on the 15-minute “Camel Caravan” show. He was the first NBC anchor of a televised political convention, the 1948 Democratic National Convention. McCormick retired in 1976 after several years of covering Capitol Hill, and died of heart failure Sept. 5 1985 at age 74. 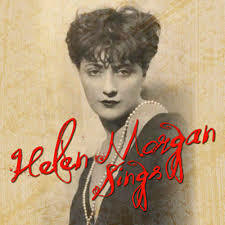 In 1932, Helen Morgan (below) joined the Victor Young orchestra to record “Bill”, a popular tune from Broadway’s “Showboat”. In 1942, CBS radio debuted “Our Secret Weapon“. It was a program that featured Rex Stout, who countered lies being broadcast by the Axis powers through shortwave radio. In 1945, radio brought word of the dropping of a second atomic bomb which caused Japan’s surrender, thus ending World War II. The US Air Force exploded a nuclear device over Nagasaki, Japan, instantly killing an estimated 39,000 people. The explosion came just three days after a similar atomic bomb was dropped on Hiroshima. 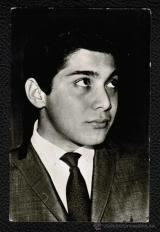 In 1957, Paul Anka, at fifteen years of age, was headed up the pop charts with “Diana”. The single spent nine weeks (out of a total of eighteen on the charts) at #1. In 1958, 17-year old Cliff Richard signed his first recording contract with the EMI label. His first single “Move It,” released 20 days later, would peak at #2 on the UK charts and lead him to become Britain’s first native-born rock star. In 1959, “Stagger Lee” by Lloyd Price topped the charts and stayed there for 4 weeks. In 1960, singer Johnny Horton was at Owen Bradley’s Studio in Nashville (for what would prove to be his last recording session) to wax just one track .. his future #1 country song (and #4 pop single) “North To Alaska” for Columbia Records. 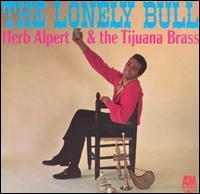 In 1962, The Tijuana Brass released their first single, “The Lonely Bull,” on A&M Records, the label formed by their leader Herb Alpert and his partner, Jerry Moss. It would soon be a Top Ten pop hit. Also in 1962, 17-year-old Brenda Lee was in the Bradley studio in Nashville to record a future #3 pop hit, “All Alone am I.” It would also be the title song on her next album. In 1963, the TV program “Ready Steady Go!” premiered on ITV in the UK. The show gave early exposure to such music luminaries as Bob Dylan and The Rolling Stones. In 1964, the 3,000-person crowd at a Rolling Stones concert in Manchester, England, got close to out of hand, leaving one policeman with broken ribs and causing two others to faint. In 1965, the No. 1 Billboard Pop Hit was “I Got You Babe,” by Sonny & Cher. The song, which sold more than a million copies, was the duo’s only No. 1 hit. A remake of the song by UB40 with Chrissie Hynde made it to No. 28 twenty years later. In 1967, American rocker Jerry Lee Lewis was ordered off the stage at the UK’s National Jazz and Blues Festival, when overly enthusiastic fans responded to his set with a near-riot. In 1968, DJs John Spragge and Bob MacAdorey were fired at Toronto radio station CHUM. 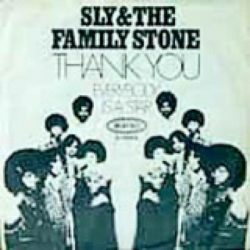 In 1969, “Hot Fun in The Summertime”, by Sly and the Family Stone, and “Easy to Be Hard” byThree Dog Night, from the Broadway production “Hair”, were singles released on this day. “Hot Fun” made it to number two on the music charts (10/18/69) and “Easy to Be Hard” climbed to number four (9/27/69). Also in 1969, during a North American tour Led Zeppelin appeared at the Anaheim Convention Center in Southern California. Jethro Tull, who opened for the band, were No.1 on the UK album chart with their second release ‘Stand Up’. In 1975, The Bee Gees started a two week run at No.1 on the Billboard pop singles chart with ‘Jive Talkin’, the Australian group’s second US No.1. In 1978, the No. 1 Billboard Pop Hit was “Three Times a Lady” by The Commodores. Band member Lionel Richie was inspired to write the song at a 37th anniversary party for his parents. lso in 1978, veteran bluesman Muddy Waters performed for President Jimmy Carter at a White House staff picnic. 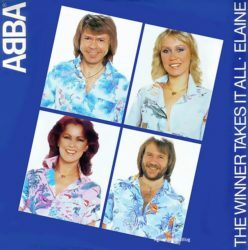 In 1980, Abba scored their eighth UK No.1 single with ‘The Winner Takes It All’, from their ‘Super Trouper’ album. By this time, both couples were divorced. In 1985, following the enormous success of the “Motown 25” TV special two years earlier on NBC, the network debuted the ill-fated “Motown Revue” variety series hosted by Smokey Robinson, which lasted only five weeks. In 1987, the No. 1 Billboard Pop Hit was “I Still Haven’t Found What I’m Looking For’ by U2. The album “The Joshua Tree” was U2’s first top 10 album in the U.S. In 1988, the Canadian airwaves erupted with the shocking news that hockey superstar Wayne Gretzky had been traded from Edmonton to the Los Angeles Kings. Also in 1988, entertainment columnist & veteran Hollywood radio reporter Jimmy Fiddler died, two weeks short of his 88th birthday. He has a star for radio on the Hollywood Walk of Fame. In 1991, The Fifth Dimension were on hand for the unveiling of their new star on the Hollywood Walk of Fame. In 1995, Jerry Garcia, 53-year-old guitarist and co-founder of the Grateful Dead, died at a Northern California residential drug treatment center. Cause of death was a heart attack. In 2002, Regina radio station CKCK-FM signed on as Rock 94, a classic rock format at 94.5 MHz. with a commercial-free preview weekend. Since 2005 the station is branded as Jack-FM. In 2003, dancer/actor Gregory Hines, who augmented a stellar big screen career with his own TV show (’97-98 ) & a role on the sitcom Will & Grace, died of liver cancer at age 57. In 2004, England`s “Classic Rock” magazine named AC/DC’s Bon Scott the #1 frontman of all time. Scott, who died of a barbiturates and alcohol overdose in 1980, beat out Ozzy Osbourne, Freddie Mercury and Jim Morrison. In 2005, singer Marc Cohn survived being shot in the head during an attempted car jacking as he left a concert in Denver. Cohn was struck in the temple by the bullet but it did not penetrate his skull. Police said a man tried to commandeer Cohn’s tour van as it left after a show; the attacker was fleeing police after trying to pay a hotel bill with a stolen credit card. In 2006, Colombian singer-songwriter Shakira played the first date on the North American leg of her 99 date ‘Oral Fixation’ world tour in El Paso, Texas. In 2007, Amy Winehouse,the turbulent diva of British pop, was admitted to hospital in the UK after collapsing from a suspected drug overdose. The 23-year-old was given an adrenaline shot and had her stomach pumped. Her publicists claimed it was a case of extreme exhaustion, and several concert dates were cancelled. Also in 2007, Jennifer Lopez won $545,000 in a case against her first husband, who planned to publish a book stating that she had several affairs during their marriage. Lopez maintained that Ojani Noa had violated a previous legal settlement preventing him from revealing private details about their relationship. The star claimed Noa offered not to publish the book in return for $5 million. In 2008, actor/comedian Bernie Mac, star of The Bernie Mac TV Show, died at age 50 of complications from pneumonia. In 2009, actor Henry Ramer, a transplanted Roumanian who earned a steady living doing voice-overs in scores of Canadian commercials and at CBC Radio, died at an age well into his 80’s. In 2010, to mark the 15th anniversary of Jerry Garcia’s death, former Grateful Dead bandmates Bob Weir and Phil Lesh sang the National Anthem prior to the San Francisco Giants game against the Chicago Cubs. Garcia’s daughter Annabelle threw out the ceremonial first pitch. In 2012, actor/director Al Freeman Jr. (below), who won a best-actor Daytime Emmy for his work as Capt. Ed Hall on the ABC soap opera “One Life to Live,” (a series he also directed), and played Malcolm X in the 1979 miniseries “Roots: the Next Generations,” died at age 78. Also in 2014, Kings Of Leon drummer Nathan Followill was injured when the band’s tour bus stopped abruptly to avoid hitting a Boston pedestrian. In 2015, former pro footall star/TV commentator Frank Gifford died one week short of his 85th birthday. A post mortem found that he had been suffering from the football-centred brain injury CTE. For 27 years he was a commentator for ABC-TV’s Monday Night Football. From 1986 he was married to TV star Kathie Lee Gifford. Winnipeg-born comedian-director David Steinberg (Seinfeld, Inside Comedy, Mad About You, Newhart) is 76. Actor/TV commercial spokesman Sam Elliott (The Ranch, The Yellow Rose, Buffalo Girls, Coors Beer/Ram Truck commercials) is 74. Soul singer Barbara Mason is 71. Chicago radio/TV personality Bob Sirott is 69. Actress Melanie Griffith (Twins, RKO 281) is 61. Actress Amanda Bearse (Married…With Children) is 60. Rapper Kurtis Blow is 59. Actress Amy Stiller (The King of Queens) is 57. NBC “Today” co-host Hoda Kotb is 54. Actor Pat Peterson (Knots Landing) is 52. Actress Audrey Tautou (Postcards from Buster) is 51. TV football analyst/former NFL & MLB player Deion Sanders is 51. Actress Gillian Anderson (The X-Files, The Fall, Hannibal) is 50. Australian actor Eric Bana (Eric, Full Frontal) is 50. CNN anchor Chris Cuomo is 48. Actor Thomas Lennon (The Odd Couple 2015, Reno 911!) is 48. Bassist Arion Salazar (Third Eye Blind) is 48. Actor Mark Povinelli (Are You There, Chelsea?) is 47. Rapper Mack 10 is 47. Model/TV presenter Nikki Ziering (The Price is Right, I’m a Celebrity Get Me Out..) is 47. Latin singer Juanes is 46. Actress Liz Vassey (All My Children, CSI: Crime Scene Investigation) is 46. Actor Kevin McKidd (Grey’s Anatomy, Rome) is 45. Actress Marya Delver (Sons of Anarchy, Leap Years) is 44. Actress Anjai Jay (Vancouver-resident) (iZombie, Continuum, Robin Hood) is 43. Actress Rhona Mitra (The Last Ship, Boston Legal, The Practice, Gideon’s Crossing, The Gates) is 42. Actress Jessica Capshaw (Grey’s Anatomy, The Practice) is 42. Actor Texas Battle (The Bold and the Beautiful, SAF3) is 42. Actress Kelly Albanese (Desire) is 41. Actor Stephen Schneider (Broad City) is 38. Actress Jes Macallan (Mistresses) is 36. Actor Daniel Henshall (TURN) is 36. Actress Ashley Johnson (The Killing, Ben 10: Alien Force, Recess) is 35. Actress Justine Wachsberger (Bonnie Blake: Parole Officer) is 34. Actress Anna Kendrick (Great Performances, 2010 MTV Movie Awards) is 33. Actress Adelaide Kane (Reign, Teen Wolf) is 28. Actor Bill Skarsgård (Hemlock Grove) is 28. Vancouver-born actress Emily Tennant (Cedar Cove, Mr. Young, Kingdom Hospital) is 28.